Design Team: Pitsou Kedem, Irena Goldberg, Hagar Ben Tzvi. 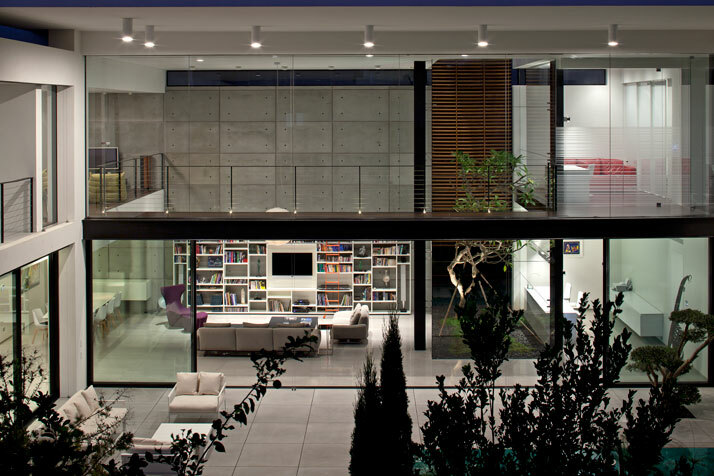 The Israeli architectural design office Pitsou Kedem surprises us with this wonderful private residence in Haifa, the largest city in northern Israel. This contemporary private residence is built in the center of a historic avenue and at the very heart of Haifa's French Carmel neighborhood. The neighborhood itself is known for the vast number of residences designed with the Bauhaus architectural style which is also known as the International Style, used in the construction of private apartment blocks in the three largest cities in Israel. Bauhaus architecture itself is known for shunning ornamentation and favors functionality, using asymmetry and regularity versus symmetry thereby grasping architecture in terms of space versus mass. The style celebrated the aesthetics of the machine and was characterized by the uniformity of color and by unassuming and simple finishes and facades. The Contemporary Bauhaus Residence on the Carmel designed nearly a century later combines elements that connect contemporary styling with many characteristics of the former Bauhaus era. As well as celebrating elements from the school of Bauhaus, the residence also includes elements from the austere minimalism of Japanese architecture amalgamated with minimalism translating these models into the Israeli environment, climate and way of life. ''The sophistication and the minimalism that existed at the heyday of the Bauhaus period have been translated, in this latest reincarnation, into a property with spatial purity and prestigious restraint,'' claim Pitsou Kedem Architects. 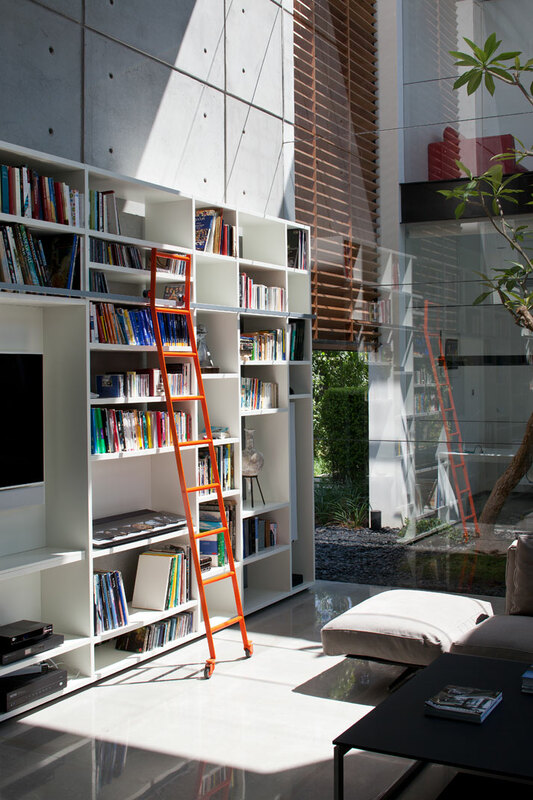 The 450 square meter residence is located on a 1,000 square meter plot. The program as well as the house’s architecture has been expressed by the architect in a free plan where spatial continuity is achieved through the existence of abundant natural light. Additionally, the entire program functions around one large and open central space; the secondary spaces and the flow of movement assists interaction “with the central space without detracting from the overall understanding of the structure.” The spaces created around the central space create an interactive experience for the user on different levels of living where the user experiences warm and friendly, yet defined spaces in the spatial continuity of the architectural design. 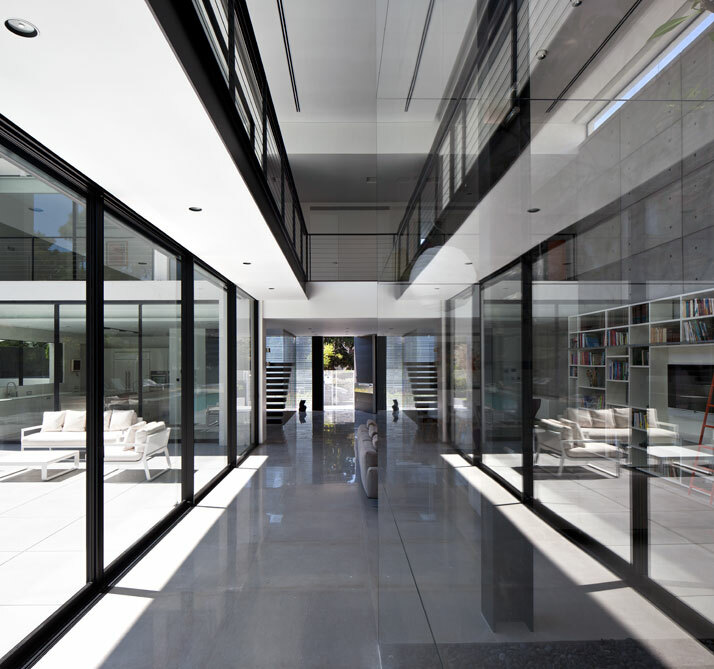 The central space which is the living room, looks out onto a courtyard and the parallelogram pool. 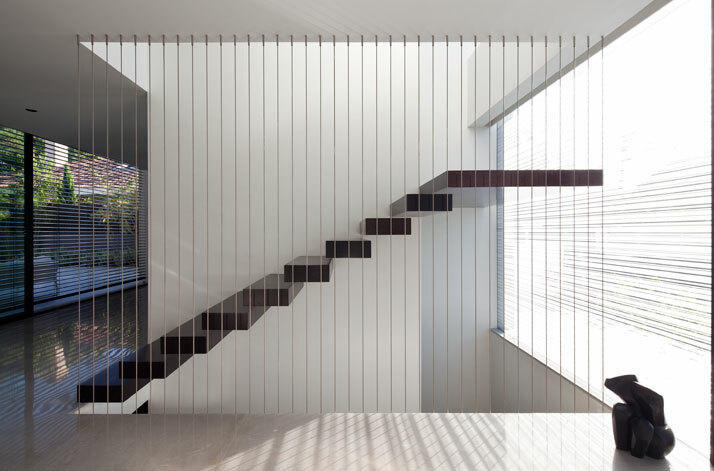 Abundant natural lighting passes into the house through the rectangular double-sized, open-space, transparent glass façade and into the building; a characteristic of Bauhaus and Japanese minimalistic architecture. Through the use of materials with no external facings, the designer has managed to show his belief that it is indeed possible to create a superior and timeless residence. The Contemporary Bauhaus Residence on the Carme is primarily designed as a residence of quiet and formal restraint; a place of tranquility and calmness where the minimalistic details and the clean language and the meaning, separate the residents from the world outside through interior design and architectural elements. The architects combine modest materials such as cement, glass, wood and steel - so much for the interior as for the exterior thus enhancing the tone set by the Japanese and Bauhaus architecture. The overall design is simple and clean in tones of white and grey with hints of intense colors in order to spice up the atmosphere. The architecture and the language of the interior design coalesce with the exterior and the light and the air found within where the simple, clean shapes and the play of light are of key importance in the interior design. The movement of light and shade create performances throughout the day as light emits through the large opening. At night, artificial lighting seeps out of the pool and mirrors into the house creating a friendly, warm and magical ambiance. The courtyard has been designed and positioned in such a way as to create a barrier separating itself from the noise of the avenue which is located right outside the house. Careful attention was also paid to the home’s front façade, which is free of unnecessary ornamentation and combines a monochromatic color scheme based on the grays and whites that characterized the Bauhaus era; only the suspended roof hints at the residence’s contemporary design regardless of the aspiration to be part of the avenue’s context and the spirit of that historical period. Despite the fact that different worlds and different eras exist in The Contemporary Bauhaus Residence on the Carme, the Pitsou Kedem Architects office has worked hard so as to assimilate this house with the historic Bauhaus structures which prevail on the avenue. The historical Bauhaus structures on the avenue and that of this modern and minimalistic home have a relationship between them - one is not a stranger to the other; as there is a feeling that one integrates with the other. In conclusion, all of this undoubtedly portrays the architects’ respect for the surrounding landscape and the Bauhaus era itself.